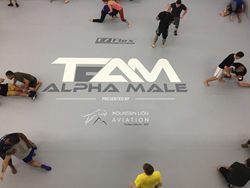 Mountain Lion Aviation partners with Team Alpha Male as their presenting sponsor providing unprecedented support to their male and female fighters. “We are so honored to be able to support these male and female warriors who serve as great role models for us all," said Jim Wilkinson, Chairman of Mountain Lion Aviation. Team Alpha Male (TAM) today announced that Mountain Lion Aviation will become the team’s new presenting sponsor. This first of its kind deal will provide unprecedented financial support for the team’s male and female fighters. This new sponsorship is also important because it coincides with the opening this week of Team Alpha Male’s new 20,000 square foot world class training facility in Sacramento, Calif.